I was doing some research today and found an interesting side note (completely unreferenced, of course!) on the Wikipedia pages of the Waban and Eliot stations on the Green Line D Branch. Both pages claim that today's Eliot was originally named Waban, and vice versa, but the first train schedules printed accidentally swapped the names of the stations, and it was deemed easier to rename the brand-new stations than reprint the schedules. 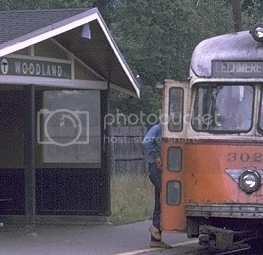 The article for the Waban (originally Eliot) station also makes reference to an "Eliot Oak" nearby, implying that the station was to be named after this tree. The only Eliot Oak I can find reference to is the subject of a Longfellow poem, and was located in Natick until 1936 when it died. Does anybody know anything about any of this? It sounds as if the original mistake is from the old B&A RR well before the MTA turned it into the D branch. I have a Boston & Albany timetable from 1905 that lists Highland Branch stations in exactly the same order as today, except for the absence of Beaconsfield and Fenway. If you believe that either the B&A or MTA transposed Waban and Eliot, you also have to believe that the town of Newton also named two of their larger streets to conform. Waban Ave. is just s/w of Waban Station and Elliot St. (notice two "L's") is just s/e of Eliot Station. Not to knock your source, but we are talking about Wiki here, right ? Might the same guy have written both entries (who may have been a 12 year old) ? Oh, I have no doubt that these types of obscure, unreferenced claims on Wikipedia are often inaccurate. That's why I came here! Does anybody know the timeline of when these streets were built versus when the rail line was built? So, rather than reprint the timetables, it was easier to take down the station signs from each building and probably one or two outside at each locale and move them to the other station and reinstall them. And all the ticket stock and forms. And have the employees assigned to the original Eliot and Waban relocate to the misprint Eliot and Waban? Waban opened in 1886, 12 years before Paul notes that Waban Ave was constructed (1898). Although, Waban does first appear in one 1891 map ( http://www.wardmaps.com/viewasset.php?aid=5946 ), but not all, this could just be when the city zoned for the street, planning for it's construction. Regardless it seems to appear after the station. Remember too guys that the Newton of that period wasn't the Newton that we think of. It was primarily sprawling farm land outside villages with an occasional estate. Most areas around here were. (I was surprised to find out that my grandmother owned a farm, not in New Hampshire, but in Mattapan !!) The reason that I bring this up is that these were also times in which cities and towns were rapidly developing, both by population and commercial development particularly helped by railroad and railway transit systems. As needed, roadways and railway stations would be added where there had been none before due to this development. So, as a general rule, the general progression goes something like this; main roadways, villages, railroads, railways, smaller roadways. I read somewhere the names got switched either on the timetable or on the signs themselves. I don't see how switching the names actually occurred, or at least if it even matters at this point, given that he Waban stop IS located in the "Waban" section of Newton, with the little strip of shops and post office nearby, etc. Edit: info about the name swap. "Originally, the Eliot stop was to have been named Waban, and the Waban stop was to have been named Eliot, but the two names were switched accidentally when the first train schedules were printed, and it was easier to change the names of the stations than to print new schedules." This is off the waban stop Wikipedia page. It the first paragraph of the history section. Here's the Eliot oak trainmanty was refering to. Quote off the same wikipedia link above. "The Eliot Oak is located east of Annawan Road southwest of the Waban station. And I note that same sentence is flagged as "citation needed".